When I was little I always found the countdown to Christmas Day so exciting. Waking up every morning and carefully peeling open the door of my Advent calendar to see what was inside. I loved how the tension would build the closer to the 25th it got. As and adult it’s easy to lose that thrill and get swept up in the commercial craziness. Through my Tiny Terrors I get so see that same innocent unbridled excitement. A little envious this year, I thought the whole family should be in on the fun. 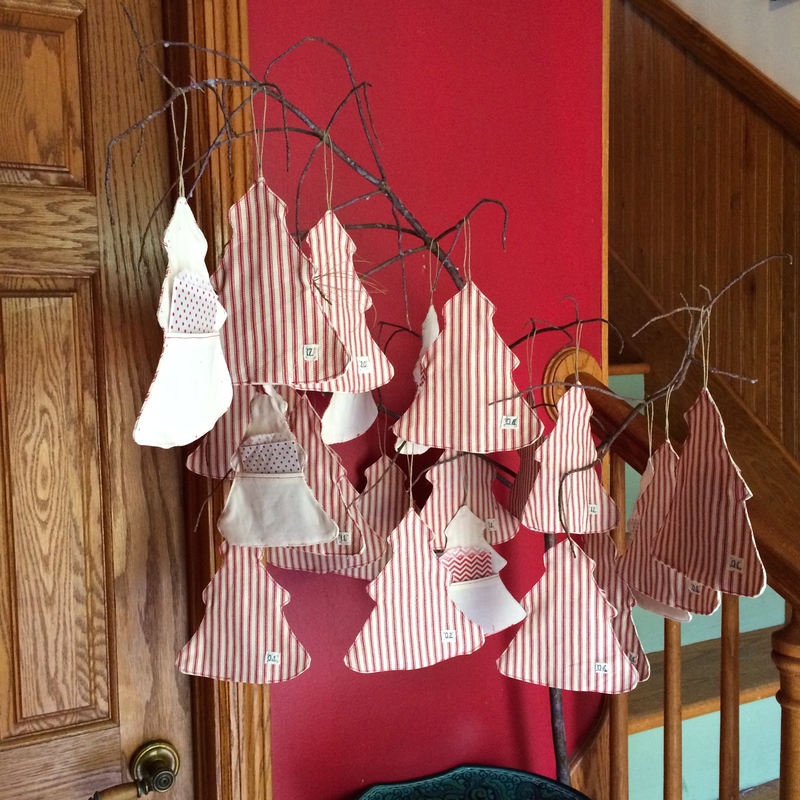 Simple and understated, these little trees have pockets on the back to hold activity cards, everyday pull out the card and have some fun. Below you can find the pattern and step by step instructions to make the trees and printables for the cards. CLICK HERE –> Advent for the free download. The PDF includes the pattern for the tree and printable activity cards. *If you cut very carefully you can get all of your trees with just 3/4 yd of the front fabric. Pattern pieces include 1/4 seam allowance. If you are adding a trunk and star to the tree then you’ll also need a few sheets of felt for each. I used my sewing machine to embroider the numbers on to fabric scraps and then stitched them on at the end. If you are hand embroidering you may way to do this step after cutting out the front pieces. You could also use iron transfer paper for the numbers, or you could number the back of the cards and/or envelopes. Cut out and iron all your pieces. Stich the fold down, I used a contrasting thread to match the colour of the front of the tree. Lay the back of the tree right side up, place pocket onto the back of the tree, right side down. Cut an 8″ length of twine, tie it in a knot. Place it on the tree back with the knot touching the top of the tree and the loop hanging down. Place the front of the tree on top, right side down. Pin around the edges of the tree, leaving and opening between the markers. Stitch the tree together, with a 1/4 seam allowance. Turn the tree right side out. Press flat, making sure to poke out the tree points fully. Here is where you’d add the trunk. Cut two pieces for each trunk and pin wrong sides together, and top stitch the two pieces of felt together. Insert the seam allowance of the trunk into the opening left at the base of the tree. Top stitch around the entire edge of the tree. Make the star now, if using. Cut two pieces for each star and pin wrong sides together, and top stitch all the way round. Sew onto the top of the tree. Print the cards, and sort through which ones you’ll use. There are a lot to choose from and there is a blank page so that you can add your own ideas. Once I’d narrowed it down I wrote numbers 1 – 24 on a sheet of paper and jotted down which activity we’d do on each day. Then popped the cards into the bag and slipped it into the pocket of the corresponding tree. I decieded to hang mine from a branch I dragged in from the garden, but I think they’d look just as adorable hanging from an old frame with lights wrapped around it or lined up neatly in a box. So cute! And I love the ideas on the cards!